What costs go into your ICD-10 transition budget - Outsource Management Group, LLC. 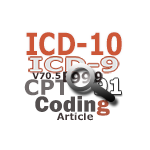 “If you haven’t figured out an ICD-10 transition budget yet, it may be too late. But it’s a good idea to get a handle on what it will cost you. You need to account for costs associated with technology upgrades, training, testing, compensating for decreased productivity and support implementation activities.